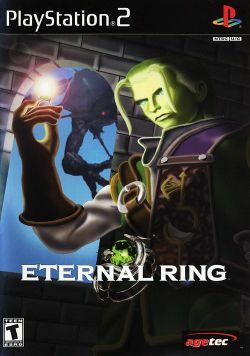 Eternal Ring (エターナルリング, Etānaru Ringu?) is a first-person action role-playing game released in 2000, a launch title for the PlayStation 2. It was developed by From Software and published in the US by Agetec. The player controls Cain Morgan, a young magician who is sent to investigate the Island of No Return, where a legendary artifact called the Eternal Ring is presumed to be held. The island is home to a large number of mythical creatures, including dragons, lizard men, and gargoyles, and is the location of magical gems and rings, including the Eternal Ring. The game is played in a first person view. This page was last edited on 19 June 2012, at 23:44.